Tug-E-Nuff tillverkar de mest hållbara och välsydda kampleksaker som vi har provat. Här hittar du kampleksaker med kaninskinn, fårskinn, fuskpäls och fleece i många olika utföranden. De flesta leksakerna finns med eller utan pip och med eller utan boll. 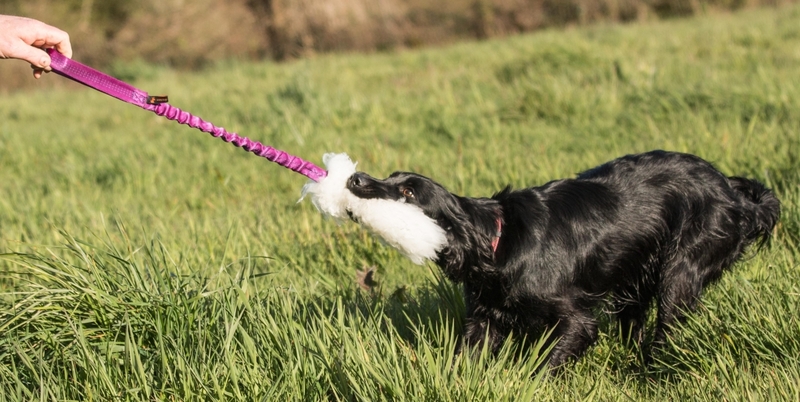 "Although we make a whole range of training toys, one of the reasons our customers come back time and time again is for our tug toys that are made with real sheepskin and rabbit fur. From our Sheepskin Ball Tug to our Rabbit Skin Bungee Tug, we have a real fur toy to suit every dog of every size and every personality. But what is it about real fur that’s so special? It’s all down to its unique scent and texture that dogs simply find irresistible. Being able to grab onto real fur or sheepskin taps in to a dog’s natural instinct to want to chase and stimulates their prey drive. It means playing with a toy that has real fur can be more engaging and fun – and as any dog trainer knows, being engaged and having fun during playtime is key to training success. We take animal welfare seriously and we’re proud to only use rabbit fur and sheepskin for our toys that is ethically sourced. All the fur is a by-product from animals that are used for meat and it is bought from trusted farms in Britain and Europe. That means you can buy real fur toys from our range with confidence."